This is the time of the Lions year when clubs are beginning to make the transition from one set of leaders to the next. Officers change, planning begins, the work of Lionism continues. The idea that spring brings new growth suggests that with the transition from one leader to the next, clubs have the opportunity to look at themselves and take advantage of new perspectives. Such is the case in my home district in eastern North Dakota – 5NE. At the final cabinet meeting for Lions District 5NE, Governor Katherine Tweed passed the gavel to incoming District Governor-Elect Dwaine Heinrich of Jamestown. 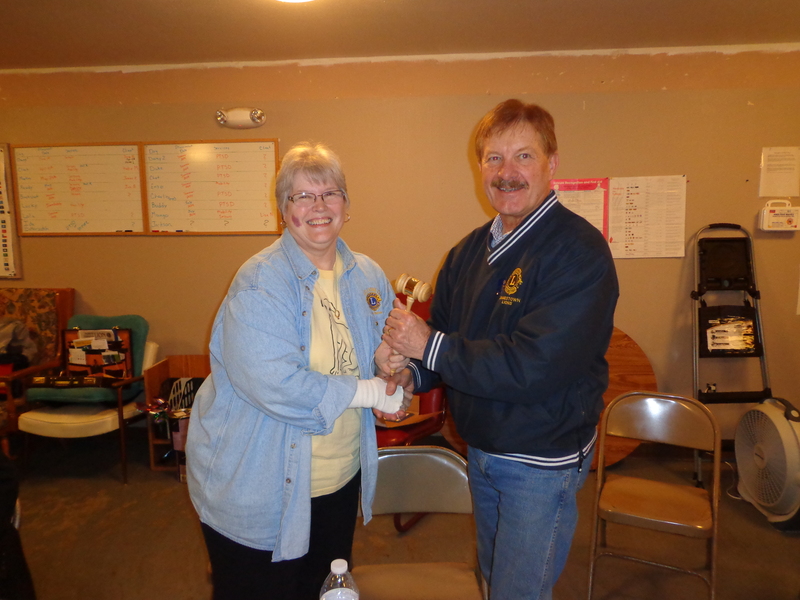 DG Lion Katherine Tweed (left) passes the gavel to incoming DGE Dwaine Heinrich. DGE Dwaine shared his vision for how he planned to move forward in 2014-15. All three of his leadership team will be involved in visitations next year so that the Vice District Governors will become more familiar with the clubs and individual Lions within them who may have leadership potential at the District level. DG Katherine and the entire cabinet pledged their support for DGE Dwaine as he prepares for his year of service as the District’s leader. 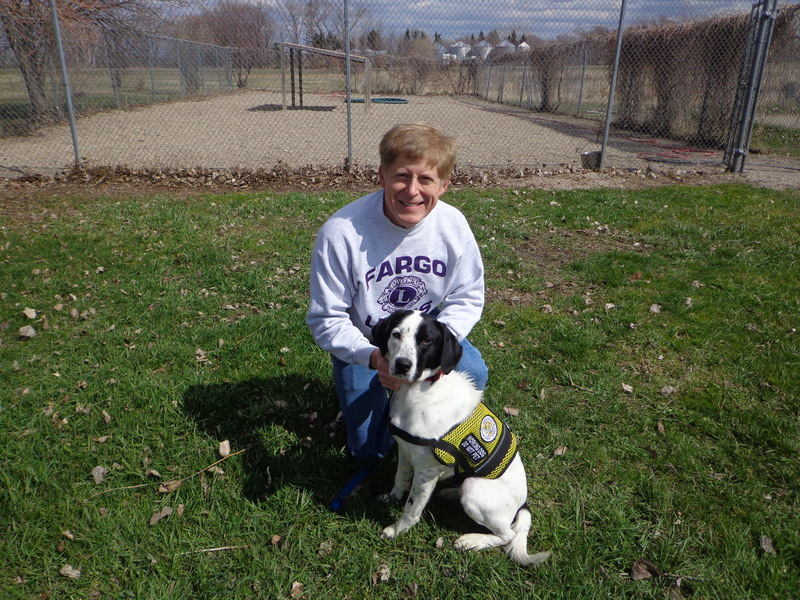 The Cabinet meeting was held in Jud, North Dakota where Service Dogs of America is located. This facility trains service dogs to assist individuals with special needs. One of the newest programs involves training dogs to assist individuals with post traumatic shock disorder. Every year on the first Saturday in May, Lions from across North Dakota travel to Jud to help with the spring clean up activities. In addition, special projects are undertaken when there are more hands to help get the work done. 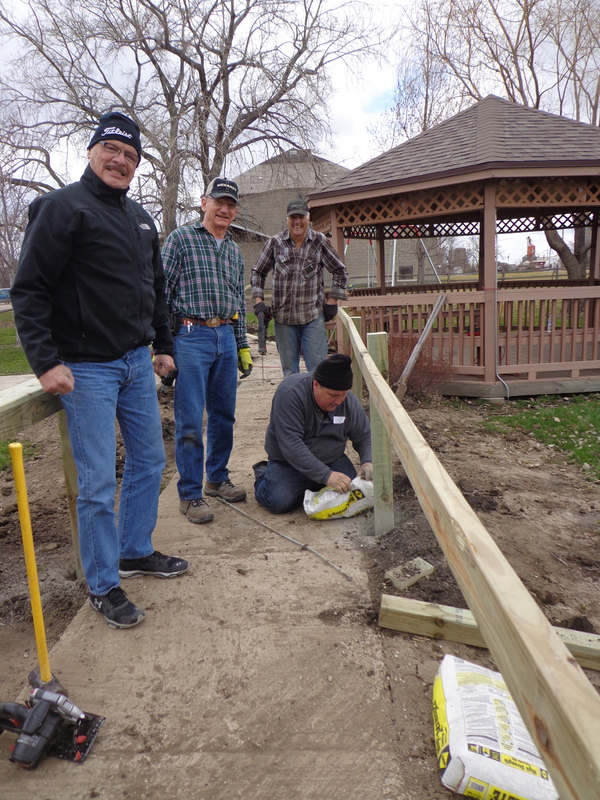 Lions worked together to place posts and guard rails on a walkway for visitors and those working with the service dogs. I had the opportunity to work with one group of Lions who were building guard rails for a sidewalk. The carpenters were good mentors and made sure everything lined up as it should. Other volunteers painted rooms, repaired decks, and some even walked the dogs. There were some volunteers like Salli Lou and PDG Dennis Anderson who spent several days. I won’t try to list everyone for fear of missing someone unintentionally. Let’s just say that there were many dedicated Lions and friends on hand to help. The Service Dogs for America program does not train dogs for those with vision deficiencies. Rather, Service Dogs for America provides dogs to assist individuals with multiple needs. This unique program was started by a Lion who donated the land where the facility is located and Lions have continued to provide funding and service to help improve the quality of the programs offered. The organizers of the clean-up provided meals to the workers during the day and on Saturday night, the Davenport Lions shared their famous pitchfork steaks and potato chips. What a great event! PCC Robert Littlefield had an opportunity to meet one of the service dogs on a break. The work of Lionism goes on. Over these past few months, I have been able to think a great deal about my commitment to service and Lionism. Being in Jud, even if just for part of a day, was a great reminder that Lions are needed everywhere and when Lions come together, the possibilities are endless.